If you are wondering where the best places to go sled riding are in Northeast Ohio, this list is for you! 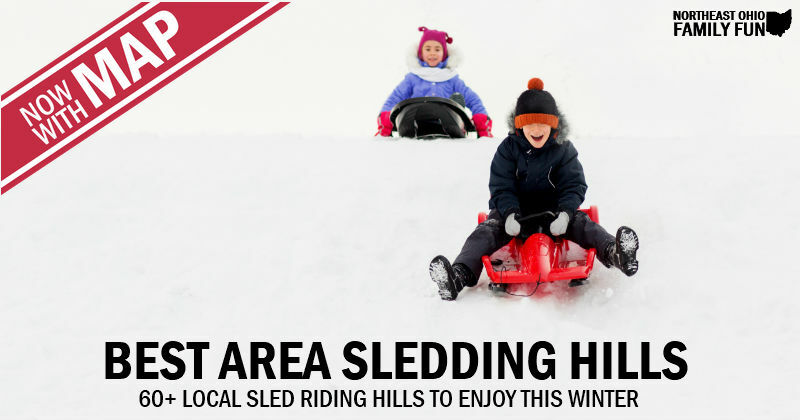 From state parks to top neighborhood hills, browse through the list of top sledding spots organized by county. Many thanks to all those who submitted locations. What about you? Have you been to these sled riding spots, or know of any hills we’ve missed? Submit the details here. Sled Riding at Rose Hill in Bay Village. Park also has a pond for ice skating. Sled Riding in Rocky River at Linden Park. Sled Riding hill in Cleveland Metroparks (Big Creek Reservation, Brooklyn). Sled riding in Shaker Heights. Multiple hills with varying inclines. The park also has an indoor ice rink. Small hill perfect for small kids learning how to ride a sled. Sledding in Auburn/Bainbridge Twps. Part of the Geauga Park District. The park also has cross-county skiing trails. Sled Riding in Chester Township. Part of Geauga Park District. The park also has cross-county skiing trails. Offers a moderate hill located off the Riverwood trail. Fire ring with firewood. From the Reeves Rd. parking lot, follow the trail toward the river to the moderate sledding hill. Restrooms open. Sledding is permitted until one-half hour after sunset. Has a small hill used primarily by cross-country skiers to practice control skills on. This hill doubles as a sledding opportunity for young children and is located off the Hobart Road entrance to the park. Restrooms open. Additional lighting provided. Sledding permitted until 11 pm. With its smaller slope, is ideal for smaller children just beginning to sled. The moderate sledding hill is located next to the parking lot. A fire ring with wood is provided near the picnic shelter. Restrooms open. Additional lighting provided. Sledding permitted until 11 pm. Shelter and fire ring with firewood. 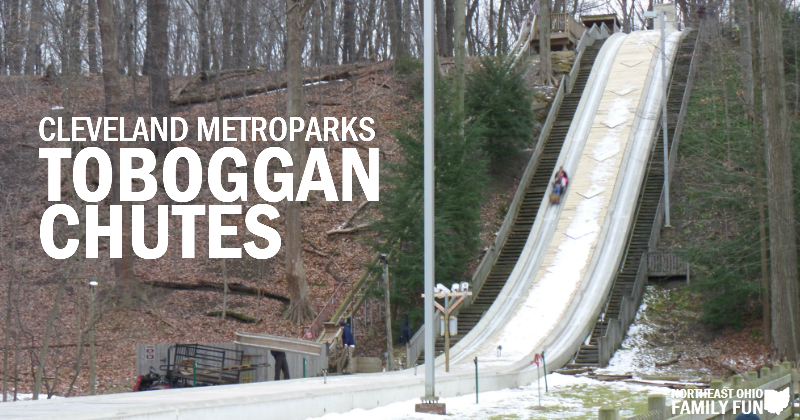 Offers the steepest, most thrilling sledding hill available in the park district. The sledding hill is located next to the parking lot. A fire ring with firewood is located near the picnic shelter. Restrooms open. Additional lighting provided. Sledding permitted until 11 pm. Lighted sledding area with multiple hills, Small hill (for children 48″ and under), Outdoor warming fire with seating and wind shield, Snow-making machine, Warming House with indoor seating, fireplace, snack bar, and vending machines. Large Sled Riding Hill. Part of the Medina County Park District. Located in Guilford Township south of Blake Road and north of Greenwich Road. Sledding in Green Ohio. The large hill with varying inclines is located by the playground on Heritage Hill and goes down to the soccer fields. Large sled riding hill with both steep and slow inclines. Lighted for those who want to sled in the dark. The park also has cross-country skiing trails. Located in the Summit Metroparks. Has a hill for sled riding with both steep and slow inclines. The park also has cross-country skiing trails. Located in the Summit Metroparks. Contains a small sledding hill. The park also has cross-country skiing trails and a pond for ice skating. Located in the Summit Metroparks. Very large steep sled riding hill. Lighted for those who want to sled in the dark. Rope along the side of the hill to help get back up to the top. The park also has cross-country skiing trails. Located in the Summit Metroparks. Multiple sled riding hills or varying inclines. Parking is located at Pine Hollow (5465 Quick Road, Peninsula 44264), Crow Foot Gully Picnic Area (5365 Quick Road, Peninsula 44264), and Little Meadow (5249 Quick Road, Peninsula 44264) parking lots. Separate areas are designated for sleds and toboggans. Park of the Cuyahoga Valley National Park. Sledding in Munroe Falls. Lighted for those who want to sled in the dark. The park also has cross-country skiing trails. 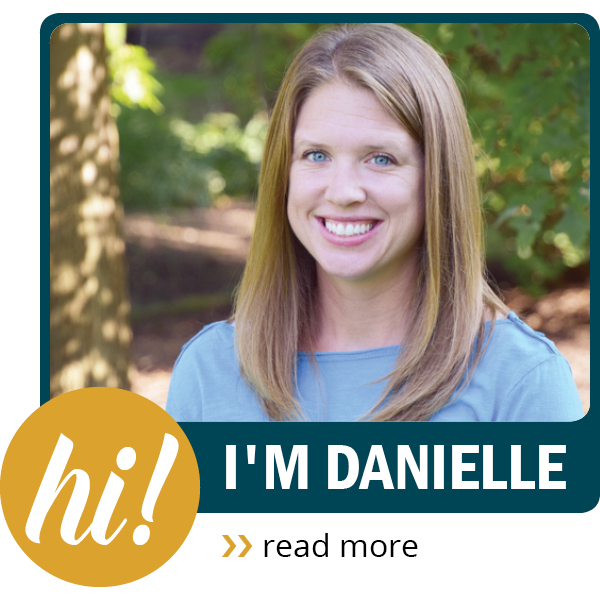 Located in the Summit Metroparks. The hill next to the Summit Christian School is a popular spot for sledding in the winter. Large sled riding hill. Lighted for those who want to sled in the dark. The park also has cross-country skiing trails and a pond for ice skating. Located in the Summit Metroparks. Sled Riding on a large hill in Canal Fulton. Sledding hill located on the Malone College Campus. Sledding hill located by the Manor House. 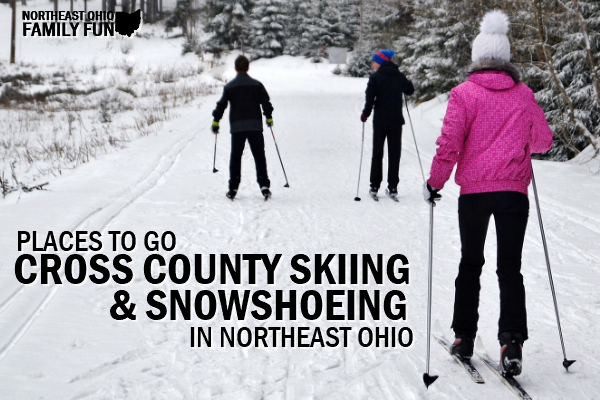 Cross County skiing is also available. Multiple hills with varying inclines. Steps to walk back up to the top of the steepest hill. Located off South Union Ave in Alliance. Large and steep hill at the golf course in Canton. Sledding hills in Massillon. Two sled riding hills with varying inclines. They occasionally have sled riding events at the hill at Roadhouse Amphitheater. Sledding hill in Wooster. The park also contains cross-country skiing trails. Remember, if you know of any other sled riding spots or have feedback on any of the ones listed above leave a comment below! 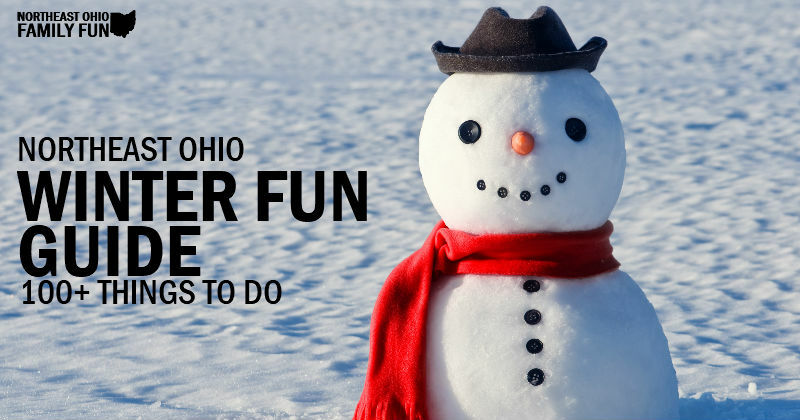 Details of over 100 Things to do this Winter in Northeast Ohio – Activities and inspiration for all ages. The hill in Portage County in Garrettsville is behind the YMCA, which used to be the Primary School. Same address, different name. Thanks for the update! It’s been corrected. Library Hill at the Kinsman Library in Kinsman, OH has a nice little hill that is free to the public. The library allows you to come in and warm up too (during business hours). 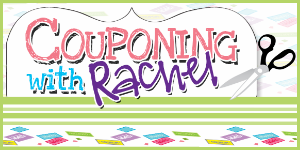 Read a book, get your circulation going again and head back out for more fun! I wish I had a picture to add. Kids and their parents love it! Thanks for letting us know about the hill. Just added it to the list. 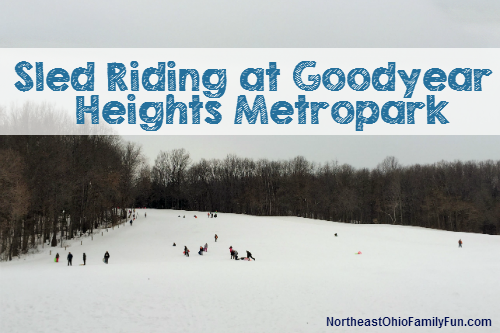 how did you manage to miss the best sled riding Hill in Medina County? The Hinckley Metroparks Hill off of State Road in Medina county is among the steepest and longest runs in all of Northeast Ohio. It is also a wonderful place to go because it is lit up at night making it safer for evening sledding. Medina County – Hinkley Park, Hinkley. State Rd. Hill. Steep and fast, but it gets old walking back to the top. Needs a ski lift! Acacia Park, used to be a private golf course at the corner of Richmond Road and Cedar Road in Lyndhurst has some awesome hills for sledding. Free. Thanks for letting me know about the hill. Just added it to the listing. A smaller , but good sledding hill in Medina county is Roscoe Ewing Park. The address is 1080 Concord Drive in the city of Medina. Thanks for leaving the comment. Is the hill located at a church (assuming it is because of the name). Just hoping to get an address for the location (if possible).